Although the snow and ice seem to be here to stay for the remainder of the winter season, slip, trip and fall prevention is something that we need to consider all year round – both inside and outside of our workplaces! Slips, trips and falls are among the leading causes of injures resulting in workers missing time at work in Saskatchewan’s service and hospitality sectors (S21, S22 & S23 WCB rate codes). From 2016 to the third quarter of 2018, falls have accounted for 17% of claims and 28% of claim costs. 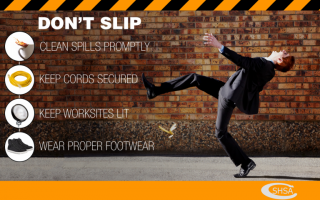 What can you do to reduce the risk of slips, trips and falls? Slow down and pay attention to where you are going! Use handrails when going up and down stairs. Select and wear proper-fitting footwear that is appropriate for the task you are doing. Change shoes at work if needed. Keep footwear in good condition. Always pay attention to the work you are doing and be aware of your work setting. Check your worksite for potential hazards, even when completing regular everyday activities. Have and maintain good lighting. Do outdoor work during the day. Use a flashlight when entering dark areas. Keep walkways clear of clutter and obstacles. Secure or cover cords or cables. Mark or identify spills and wet areas. Use appropriate, non-slip flooring material. Always close filing cabinets or storage drawers. Do not let objects that you are carrying or pushing block your view. Keep one hand free to balance or break a fall. Take shorter strides and have feet pointing slightly outwards to improve balance. This is called the penguin shuffle during winter months! Clear snow and ice accumulations at your worksite such as in parking lots and on sidewalks and entryways. Paint smooth floors with sand set in the mixture to increase traction. Always use a ladder, step ladder or step stool to reach high shelves (never stand on a chair or box). Ensure that your ladders, platforms or other equipment are in safe working condition. Use guardrails and/or warning devices for open sides, edges and openings. Maintain three-points of contact when getting in and out of vehicles, equipment or climbing ladders. Take breaks to stay alert. When working at heights, use the appropriate travel restraint or fall protection system for the work that you are doing. Well I truly enjoyed reading it. This information procured by you is very constructive for correct planning. Fantastic website you have here but I was wondering if you knew of any message boards that cover the same topics discussed here? I’d really like to be a part of community where I can get feed-back from other experienced individuals that share the same interest. If you have any suggestions, please let me know. Thanks a lot!